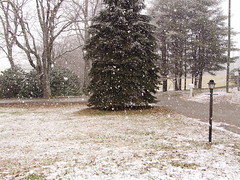 We had a lovely snow fall Monday, with big drifting flakes that settled gently on the trees, only to vanish with the sunshine later in the day. Now it's colder and I have a fire in the wood stove downstairs popping cheerfully away as it warms the place. The spinning muse has descended; I wish I could put aside all my other work and just spin, spin, spin in front of the fire. 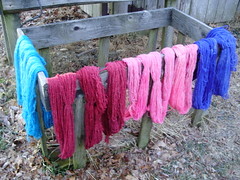 I managed to get some singles plied that I spun on the great wheel during demonstrations this past summer and dyed them up yesterday in bright colors for a project that Jane Plaugher of Fiber on the Mountain and I are working on together. I love creating these rich colors but it can be something of a challenge to work with them. This wool was reluctant to take the dye evenly for some reason. I now have a wonderful dye room here at the shop that will make the work much easier. Friend Linda loaned me two hot plates, which worked wonderfully well yesterday.